In the G.O. 1st read above, orders have been issued constituting PublicService Commission for the State of Telangana. The Secretary, Telangana State Public Service Commission in the reference 2nd read above, has informed that the existing scheme and syllabus of United Andhra Pradesh has to be changed as per the needs and requirements of new State of Telangana and therefore, the Commission has constituted an Experts Committee to study and make recommendations to review the present classification of Groups and other services; scheme and pattern of examination of posts comes under the purview of the Public Service Commission. The said committee has submitted its report and the same has been furnished along with the recommendations of the TSPSC for approval of the Government. In the G.O. 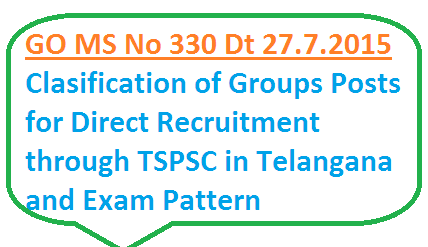 3rd read above, a Cabinet Sub-Committee has been constituted to examine and recommend on Scheme of Examinations for various posts to be filled by the Telangana State Public Service Commission by the method of direct recruitment, keeping in view the report of the Expert’s Committee and the recommendations of the TSPSC. The Cabinet Sub- Committee has submitted its report to Government.